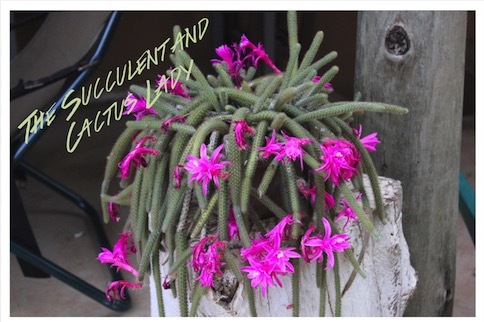 THE SUCCULENT AND CACTUS LADY - I am a naturalist and gardener no longer living on my little piece of African soil in Tarlton, Gauteng, South Africa. I now reside on the lush and tropical North Coast of KwaZulu Natal, South Africa. This is a record of my love affair and obsession with cacti and succulents. 🌿 I've been gardening ever since a child, when I spent time with my father in his vegetable garden. But my fascination with Echeverias started in the 1980's, when my father gave me a pot with five Echeverias, which turned out to be E. imbricata. At first I wasn't much interested in them and planted them in some obscure corner of the garden and completely forgot about them. How great was my surprise when, a couple of months later, I noticed that they had spread and made a beautiful display - I was hooked! The funny thing about succulents is, once the bug has bitten you, it lasts forever. When we left Gauteng a year ago, I gave all my babies away to a good home, often thinking about them, missing them and visualizing starting a new family as soon as I could. My new (temporary) home didn't allow for much gardening, but the minute I could, I found a space, called it my 'propagation station', and lovingly cultivated a few cuttings. Most were cuttings or leaves given to me by friends and other succulent-lovers and some were collected the old-fashioned way, picking up shed leaves and broken pieces off garden pavements. Crassula perfoliata - the first flower! Dedicated to all you succulent-lovers! The first flower! Now for the long wait, as I hear this can take quite some time before it opens! Crassula perfoliata is an attractive summer-flowering succulent with greyish-green sickle-shaped leaves and red flowers. It is easily grown from cuttings or seed. This indigenous South African plant is confined to quartzitic sandstone outcrops (rarely shale), from the Groot Winterhoek Mountains and Port Elizabeth in the south to Umtata in the north-east. The plants grow solitary or in small clusters on north-, east- and west-facing cliffs along dry river valleys. It likes temperatures of about 25°C and the average daily minimum about 10°C and somehow I don’t think this plant is frost-hardy, so I will be bringing it inside for the winter. 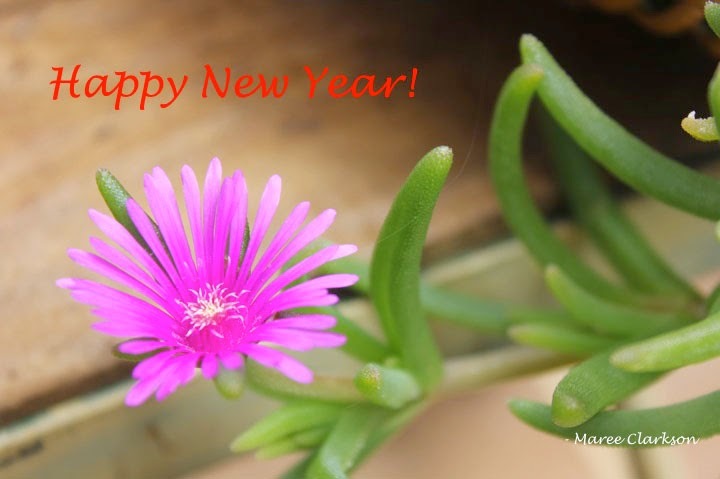 In this coming year, plant dreams, pull weeds and grow a happy life! After giving all my succulents away when I left Gauteng last December 2017, I have now acquired a brand new little piece of Crassula tetragona - a new beginning! Pronounced KRASS-yoo-la tet-ra-GON-uh subsp. row-BUS-tah. Afrikaans: Karkai (Ken enigiemand hierdie Afrikaanse naam...? Tetragona is a unique variety of evergreen succulent that is native to South Africa and also known as the Miniature Pine Tree due to its foliage resembling a pine tree. Often used as a popular bonsai specimen, grows well in pots or in the ground and grows to a height of 1 meter, this plant grows well in full-sun to partial sun, needs a good water when the soil has dried out. Native to Southern Africa, it is widely distributed from the Orange River boundary of Namaqualand to beyond the Kei River in the Eastern Cape. Wikipedia says "Tetragona" comes from the phyllotaxy of the leaves. It is popularly named the "miniature pine tree" among ornamental plant enthusiasts, for its popular use as a "pine tree" in Bonsai. I've never had much success with growing Haworthia Cooperi. This one of mine started deteriorating soon after I acquired it until it was completely dead! 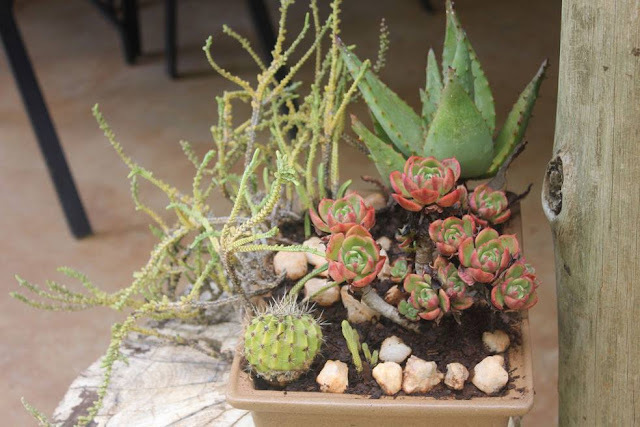 Haworthia cooperi is a diverse and varied species of the genus Haworthia in the family Asphodelaceae, endemic to the Eastern Cape Province in South Africa. It is a fast growing, clustering species with soft, fleshy foliage (the leaves have the feel of tiny, plump grapes). While it clusters, it adds additional offsets slowly, gradually increasing its size to fill a 3 to 4 inch pot. This plant thrives in dappled shade and I think the mistake I made was to let it get too much direct sunlight. Another factor is that the haworthias show evidence of stress when temperatures become very high (above the mid 90°F - 32°C), which was often the case in my garden, even when the plant was in the shade. 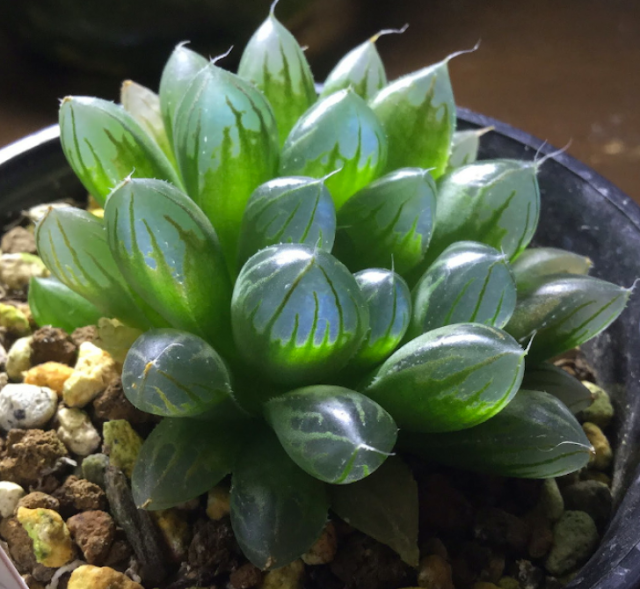 Fat juicy leaves and translucent flesh are the hallmarks of Haworthia window plant. Not all Haworthia have the see-through leaves, but those that do are spectacular specimens of the genus. The happiest Season of all! Christmas, and summer time. 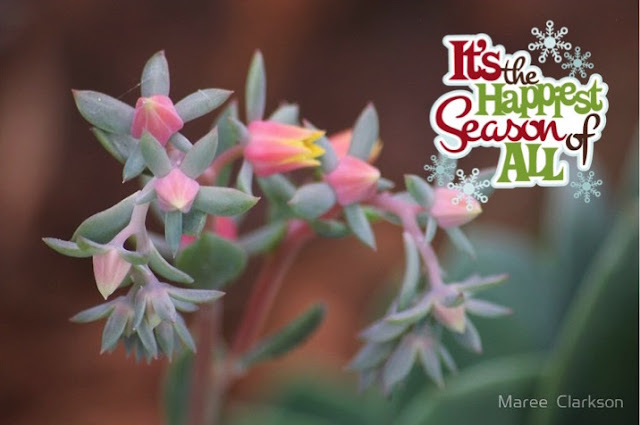 Everything is in full flower (Echeveria imbricata). Surely it must be the happiest season of all! Here's wishing you a Merry Christmas and a festive season filled with LOVE, JOY and INSPIRATION! Wishing you and your succulents a magical and blissful holiday! 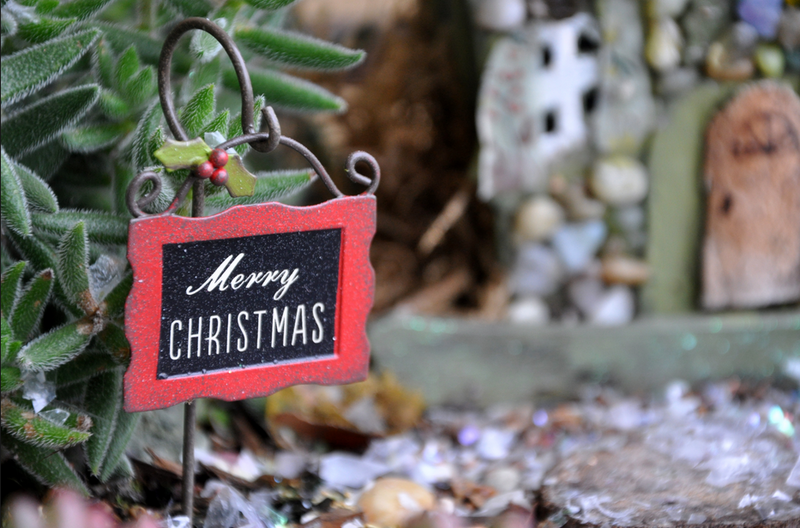 May this Christmas season bring you nothing but fond gardening memories, happiness and laughter! 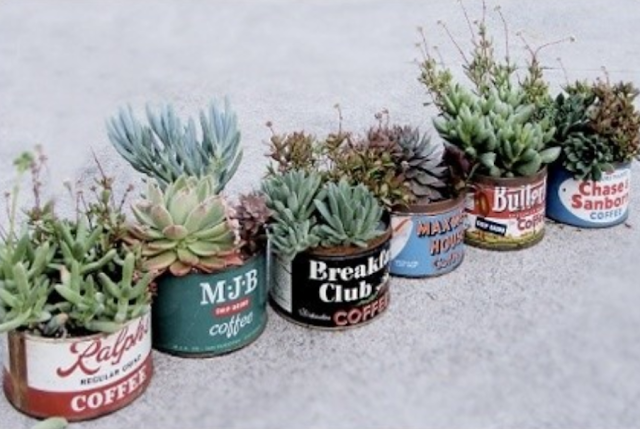 Use empty food tins as pots for your succulents. Just remember to punch a few holes in the bottom to enable good drainage. My Mother's Day gift this year (May 2018), Hoya kerrii ‘Variegata’ (Sweetheart Hoya) is a climbing plant that can grow up to 13 feet (4 m) tall. The stems are up to 0.3 inch (7 mm) in diameter. 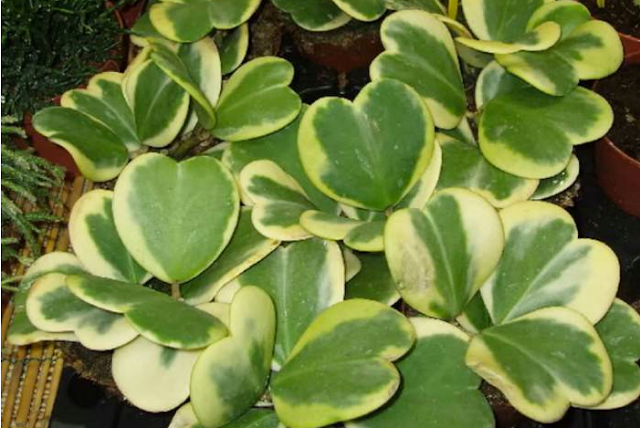 The leaves аrе thick, variegated, heart-shaped, are up to 2.4 inches (6cm) wide. Adult plants show inflorescences of up to 2 inches (5cm) diameter and up to 25 small, star-shaped flowers, creamy-white with pink to rose-purple centers. Also called Wax Plant. Hoya plants don’t ask for much, beyond the well-draining soil and the warm humid conditions that many tropical flowers crave. They don’t like wet feet or heavy soil, and as many grow as epiphytes in nature (similar to bromeliads and orchids). Give them at least a half day of sunshine, and bring them indoors when temperatures drop below 50°F (10°C). When your Hoya finishes blooming, leave the flower stalk, as it may produce new flowers. Removing the stalk forces the plant to produce a new stalk, which delays blooming and wastes the plant’s energy. They are light feeders, and a monthly drink of compost tea or dilute fish emulsion provides all the nutrition these tropicals need. Hoyas like the security of a snug pot, and plants that are a bit root bound will flower more prolifically than those that are swimming around in a giant pot. Hoya is native to the south-east of Asia. 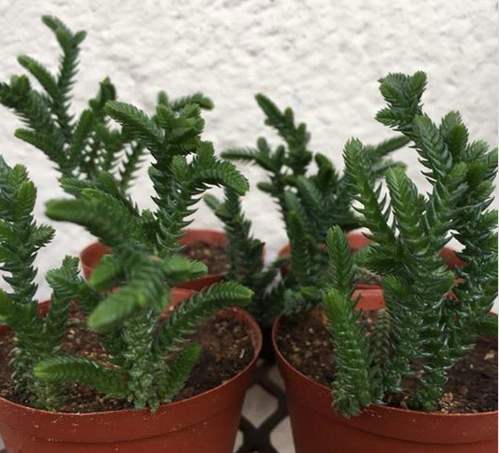 Crassula muscosa (also known as Rattail crassula) - is a succulent plant native to South Africa and Namibia, belonging to the family of Crassulaceae and to the genus Crassula. It has very small, light green leaves that are densely packed around a thin stem, and the arrangement of the leaves around the stems gives them a square shape. It grows as an intricate bush with very small yellow-green flowers, with a maximum height of 15–20 cm. It loves environments with a moderate degree of humidity, in which the soil is well drained and composed of fertile soil and sand. Also known as the Watch Chain Plant, if planting it indoors, place in a room that gets a lot of sunlight, such as near a north-facing window. Best color maintained with a little shade, even on the coast. Being so easy to propagate they popped up here and here. and a visit to a garden centre set his senses fit to bust. You could almost see the pound signs flash before his eyes. 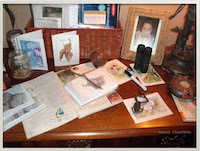 He was so thrilled because he thought he’d saved a tidy sum..
Our desire for echevarias got less – and – less and - Less. 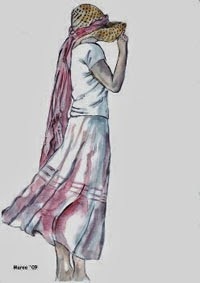 Society: You say that because you want people call you 'pretty'. Echinopsis grows pretty much anywhere. 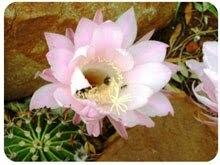 Here in South Africa they can tolerate summer temperatures of 30°C or greater, which is hot enough to spur growth of both Echinopsis pups and their amazing flowers. They also tolerate cold temperatures well during winter months. However, I bring my potted ones inside during hard freezes or their water-filled bodies will freeze as well. Compared to most cacti, Echinopsis bloom fast and furious. They typically begin blooming in spring. Most blooms only last one or two days and they frequently open at night. But it’s common to have several buds on one plant developing at different rates; so a single plant can be in bloom for several weeks. As a general rule, the smaller the diameter of the blooms a Echinopsis species produces, the more blooms the plant produces. Species that produce monster blooms (some over 6” in diameter) tend to have fewer blooms as so much plant energy goes into producing each one. 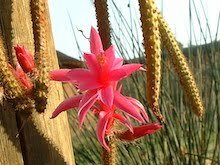 Echinopsis generally begin to produce flowers when they are two or three years old. Echinopsis is a large genus of cacti native to South America, sometimes known as hedgehog cactus, sea-urchin cactus or Easter lily cactus. One small species, E. chamaecereus, is known as the peanut cactus. 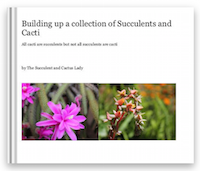 The 128 species range from large and treelike types to small globose cacti. A garden requires patient labour and attention. 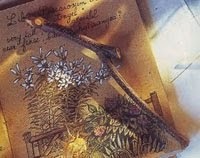 Plants do not grow merely to satisfy ambitions or to fulfil good intentions. They thrive because someone expended effort on them. Gardeners are well primed to provide food for birds and animals, but the key to encouraging the widest possible range of wildlife is to think of creating a habitat for creatures to live in. The most important aspect of this is the provision of shelter from the weather and from predators, as well as a place to lay eggs, rear young or hibernate. ©Maree Clarkson - Unauthorized reproduction prohibited and just plain rude.